“The fundamental condition of the writer is helplessness,” says American poet, Louise Gluck, in her collection of essays, Proofs and Theories. She then goes on to discuss the un-provability of truth and the lifelong anxiety this produces in writers. Do artists suffer from a similar anxiety? What, you may ask, is the relationship between helplessness and Michael Snow? Snow, an artist who saw fully-formed in his mind entire series of works, that he held in his imagination until he found time to spit them out into reality. 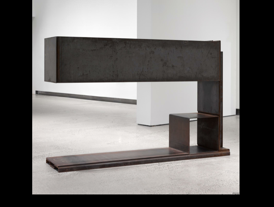 Michael Snow, Seated Sculpture, 1982, steel. 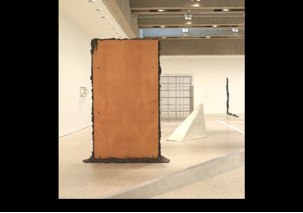 You are invited to climb inside this work. I did so, and immediately my peripheral vision was blocked; two arms of industrial steel encouraged me to look straight ahead, where more steel cut off my view. I felt a twinge of helplessness, and then my acoustic world amplified. Unable to see, I listened. Two guards were chatting; someone wearing winter boots entered the gallery. I slipped out of the sculpture and read the tiny description on the wall. “Wings of steel wrap around you.” Wings? No way. Arms, maybe. As I slipped back inside the sculpture, a part of me banged against the steel, which released a ringing, deep as that of a church bell. Wings, I thought; yes, perhaps, after all. The vibration of wings, of sound. Angel? Or hummingbird? In Snow’s work the acoustic and the visual are never far apart. His objects make you listen; and you hear nothing. They open a fertile silence inside you. A disorienting silence, a silence of helplessness, into which his materials speak, of strength and harmony. His works say: industrial steel, polished aluminum, lead; they say abattoir, confines, freight car, rail, electric chair, industrial scales. How much are you worth, and who is doing the weighing? 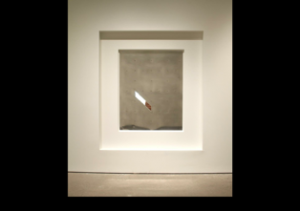 Michael Snow, Sight, 1968, aluminum, plastic. They say: Chivalry, polished armour, slit, visor, arrow loop, slanted vision. 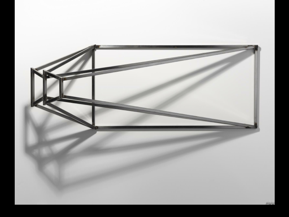 Michael Snow, Aluminum and Lead, 1968, aluminum, lead. 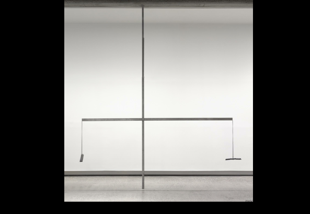 They say: balance and tension, imminent movement, repose; two uneven weights held in perfect balance by two uneven arms. 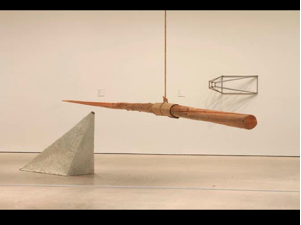 Michael Snow, Abitibi, 1969, plywood, epoxy, resin, steel, bolts. What is the paint doing on the inside, hidden by two blank surfaces of wood? Why is this paint being tortured, forced to ooze out by a pressure produced as screws are tightened? Paint is not just pigment. Here is raw paint in unctuous motion, liberated from tube or jar, not yet subjected to the stroke of a brush. We have entered the language of raw materials. Listen, says Snow, listen carefully to your material. Don’t adorn. Allow each utterance space. Vibration. Allow helplessness, disorientation. 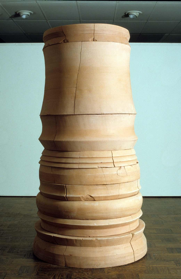 Michael Snow, Transformer, 1982, wood, varnish, rope, cardboard. Did Snow realize that he was creating a work for novelists when he stripped a tree of branches, polished its entire length and suspended his giant compass needle from a rope? Towards what tapered conclusion is the story narrowing? Whose voice does the pointing? Which character is on the receiving end? A slight displacement of air, the needle’s direction shifts causes the story to aim in a new direction? The slightest movement and you could become the story’s focus. Take your time. Move your listeners slowly through your story. I come to Snow’s work as a writer? Who do you come as? The illustrious French writer, Marguerite Yourcenar, claims that all bad writing can be attributed to a single cause: too quick a movement from one sensation to the next, a failure to listen to what lies between. It is, she asserts, in the gaps between sensations that the truth occurs. 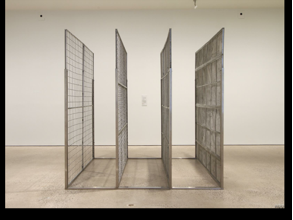 Michael Snow, Blind, 1968, steel, aluminum. Core is mute. The beloved, impenetrable. Core divulges nothing about the inside shape of things. It offers a surface, at once classic and random in the arrangement of its markings. You could be in Mesopotamia or the twentieth century. With clay, time becomes Snow’s subject, and the powerful allure of the invisible sets your mind in circular motion. You are a dog chasing your tail through a speechless universe. As a writer, when I circle Snow’s ceramic tower, I want to know how my readers feel each time I refuse to let them in, each time I force them to circumnavigate an event to guess at a character’s hidden motive? Do they press their ear to the clay? 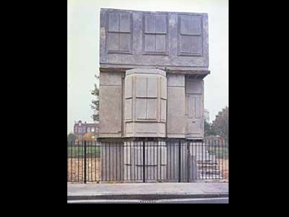 British sculptor Rachel Whiteread is another artist who loves the disconcerting muteness of negative space. Here, she’s stripped away a house and left a concrete mold of its interior. I often show her work to writing students and ask: Can your readers breathe? Where are the silences in your text? Make your reader press their ear close. 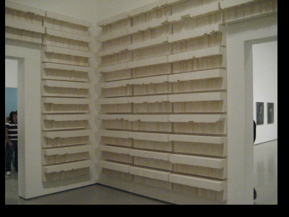 Rachel Whiteread, Untitled (paperbacks), 1997. Remove the books, leave instead the solid shape of the air separating the absent books from each other and from the shelves and the wall. Michael Snow, Sighting, 1982, aluminum. I wander amongst Snow’s “objects of vision,” viscerally aware of the precision required to achieve fragile balance, that the scales may tip at any moment, the needle point in a new direction, and that from no single angle can the whole truth be told. Into this uncertainty enters beauty and the weight of helplessness is removed, replaced by the lightness of awe.